Congratulations, Mark Breyer, "Top 20" Lawyer! | Phoenix Personal Injury Law Blog - Breyer Law Offices, P.C. blog home Firm News Mark Breyer Received a Top 20 Verdict in Arizona! 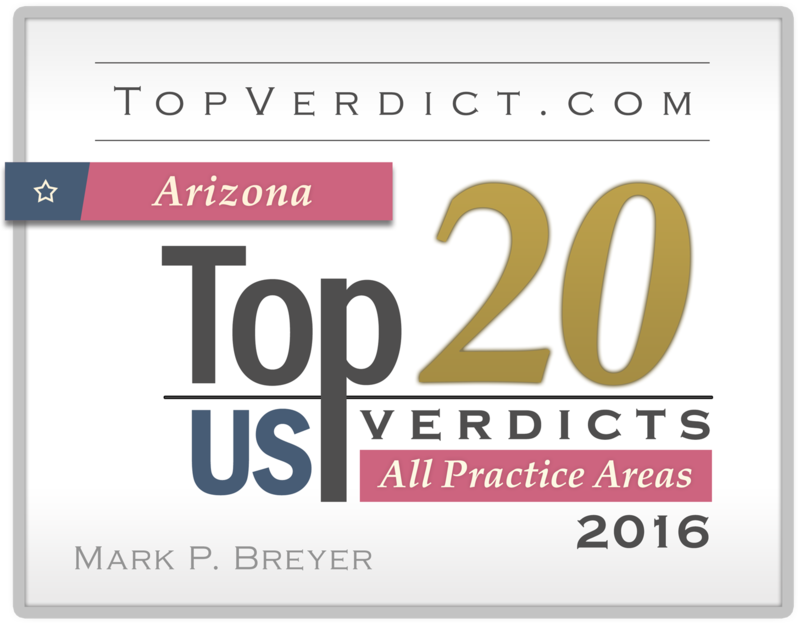 Mark Breyer Received a Top 20 Verdict in Arizona! We are proud to announce that Mark P. Breyer was ranked in the “Top 20” on TopVerdict.com’s list for the year of 2016! He won over half a million dollars for one of our clients who was injured in a slip-and-fall accident. Top Verdict recognizes attorneys and law firms that have won the largest verdicts, court awards, and settlements for their clients. This honor is based on historic facts and not on the opinion of others—whether that of peers or a panel of experts. Top Verdicts recognizes results, and finding these requires extensive research into court records, electronic submissions by attorneys, and major legal publications, amongst other documentation. Receiving Top 20 for the State of Arizona adds to Mark’s impressive list of achievements. Whether it is a perfect Avvo rating or the highest rating on LexisNexis, Mark is often recognized by national and local distinguished institutions. Though this is “just” another achievement to add to his already-large repertoire, it doesn’t take away the excitement of being recognized by such a prestigious company! Mark and Alexis Breyer have been growing their firm and practicing personal injury in Arizona for over two decades. Both have been recognized on local and national media and received multiple awards through different websites. Mark and Alexis have grown their firm by providing unparalleled client experiences and producing exceptional outcomes for their clients, and Mark being awarded the Top 20 just reaffirms their hard work and dedication. It takes a wonderful team to bring home great verdicts, and Breyer Law Offices, P.C., definitely has that! If you need help with a legal matter, just give them at call at (602) 267-1280 for advice.